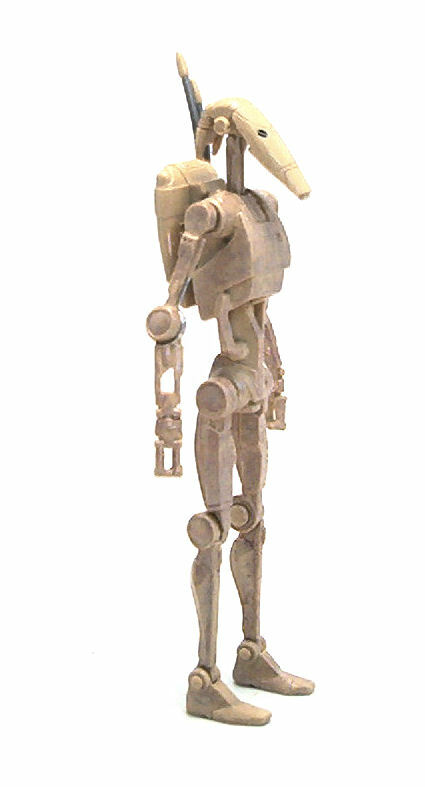 If there ever was a character or from The Phantom Menace nobody really wanted another figure made of, it must be the lowly Trade Federation Battle Droid (VC78). I know that the first wave of 2012 was an assortment designed to appeal to the people who would go and watch the 3D release of the movie, but it still makes little sense to have included this figure in the mix. 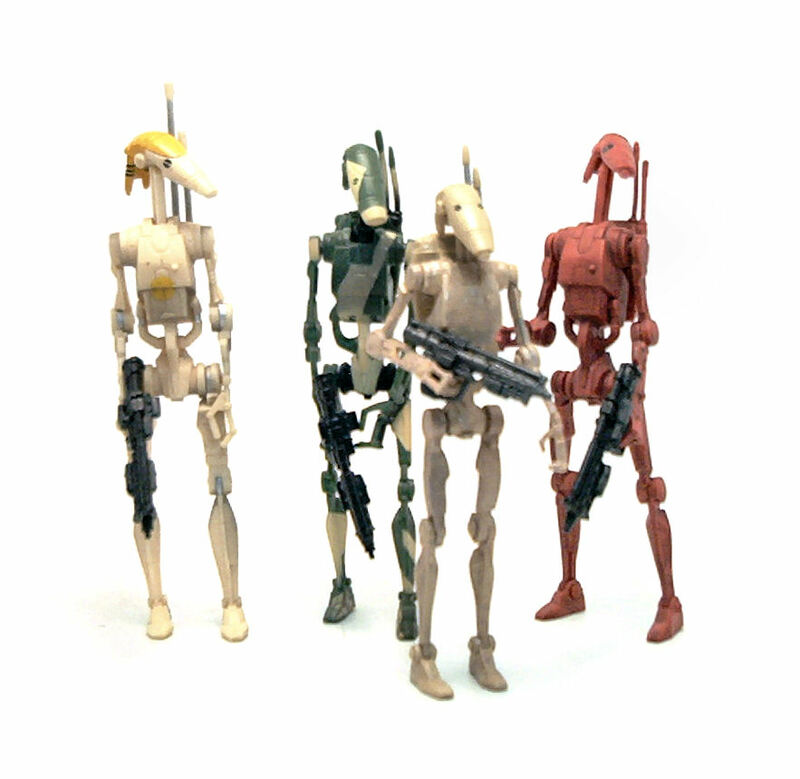 True, there have not been good Battle Droids made in this particular color in a number of years, but the really baffling thing is that Hasbro developed new tooling for this version of the Battle Droid, when the Droids released in the Saga Legends line were perfectly fine, and came two to a pack. 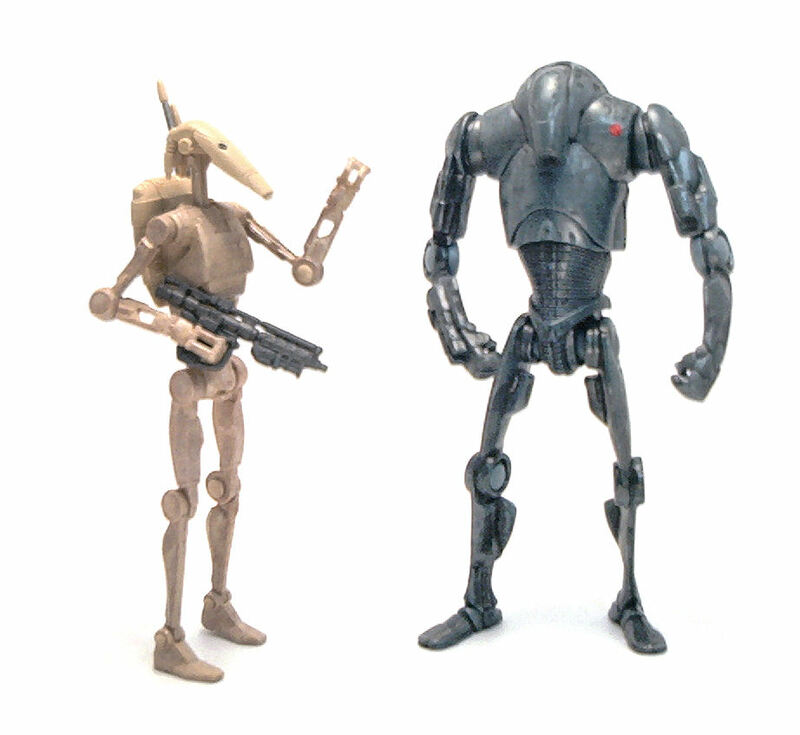 One key difference between this new Battle Droid and those in the Saga Legends line is the size, with the new one being slightly shorter and somewhat thinner. The one aspect where you can see a definite improvement is that now the “eyes” of the droid are actually sculpted instead of being just paint. Even though, technically, the joints on hips and shoulders are ball joints, they actually function mostly as simple peg swivels with a tiny bit of wiggling room on them. 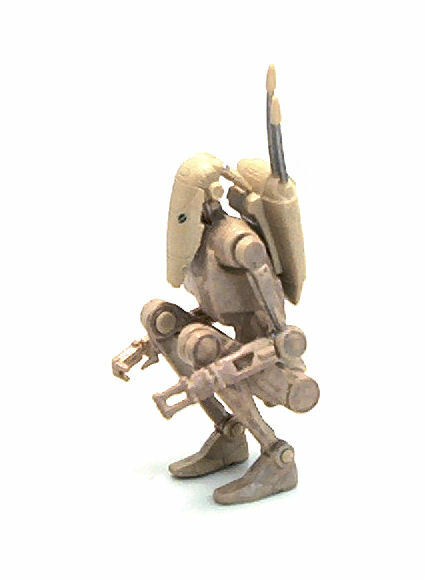 Given how thin the limbs are it is just not possible to have joints that would allow the Battle Droid to hold his weapon using both hands. 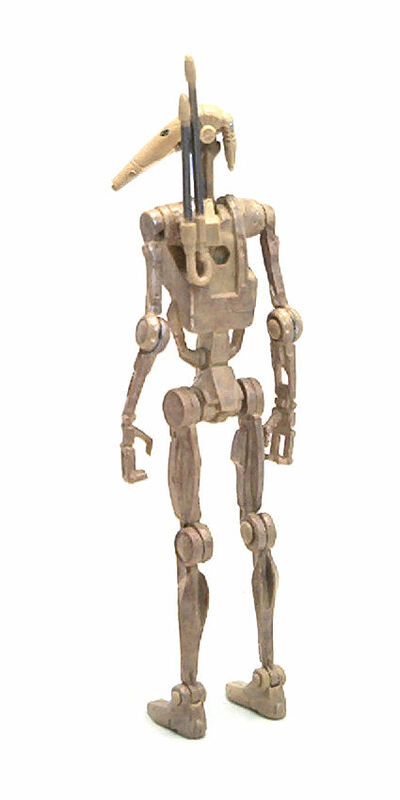 This time it seems this droid was made from a firmer material, which helps a lot in keeping it standing on it’s own. The folded-in mode looks good but then again, it’s something Hasbro already had perfected with the SL release. The paintjob on the Battle droid is extremely sparse. The recessed “eyes” are painted in a very dark brown color and drybrushed silver was applied to the body to represent weathering, although they left head and backpack pretty much untouched which does look odd even though it is not something one would notice right away. 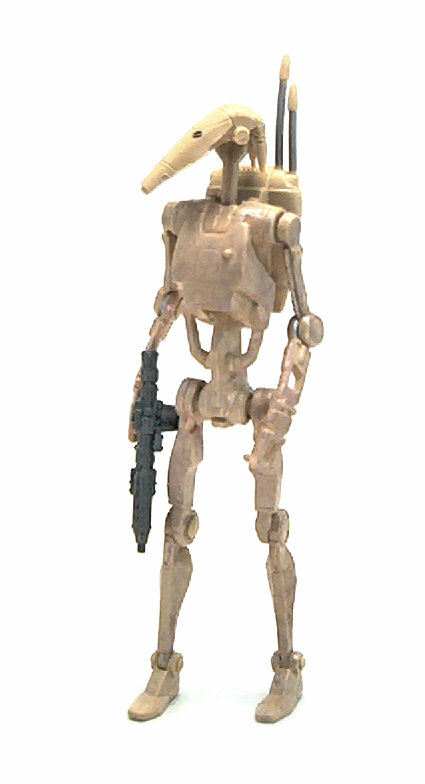 The accessories included with this Battle Droid are a backpack, a droid blaster and an alternate antenna. 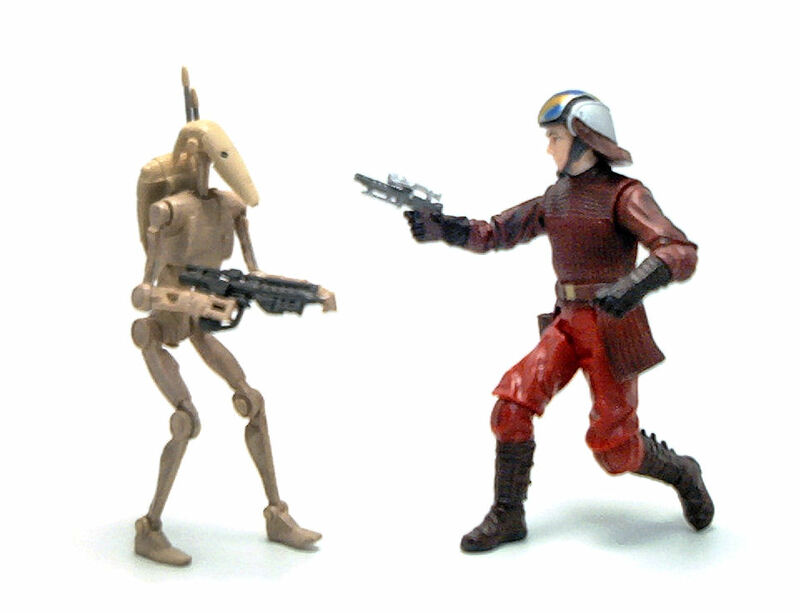 The inclusion of this last accessory shows some deviousness on Hasbro’s part, as if they were enticing you to get more than one of these Battle Droids in order to have them displayed both ways, which brings us to my main point of contention regarding this figure: Why would I pay the going price on Vintage Collection figures when there are still loads of the Saga Legends 2-packs out there which cost less even without discounts? Well, to answer that, I did it because I was genuinely intrigued by this new release and I had store credit to burn, but there is no way I’ll be getting another one of these until they go on clearance. 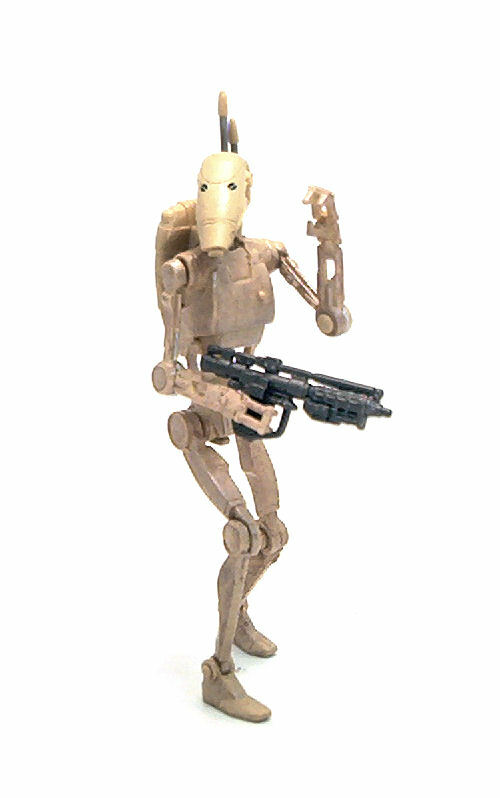 The Battle Droid is actually pretty good figure by itself, but the only thing it has going for it right now is that it is a completely new mold; if you already have any of the previous versions it would be probably best to skip this one for the time being, but if that is not the case, then this one is an all around solid buy.